Messenger of Truth [Audiobook Review] – my books. my life. Maisie’s newest client is a woman convinced her twin brother’s accidental death was no accident. This books take Maisie into the London art world, from artists to buyers to galleries. 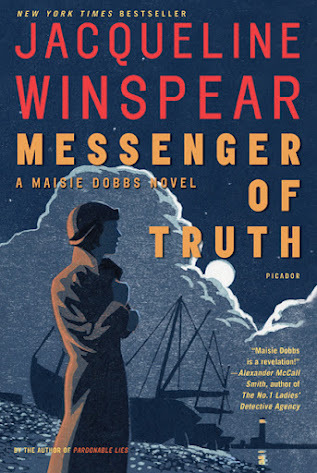 Messenger of Truth also brings us to the Great Depression, which we see though Maisie’s unique persepective. Once again, Winspear has created an engrossing story filled with odd characters and unexpected twists. Although I still think that sometimes these stories wrap up a little too conveniently (seriously, the way the “bad guy” was caught this time was a little ridiculous), I continue to enjoy Maisie’s adventures. Cassidy continues to do a fantastic job with this series. Previous Article 6 Months: My Breastfeeding Story…So Far. This wasn’t my favorite of the series, but I really like the ones that come after. It always makes me happy to see someone enjoying this series. I’d really like to be a part of online community where I can get feed-back from other experienced people that share the same interest. If you have any recommendations, please let me know. Thanks! it might not be a taboo subject but usually people don’t speak about these issues. To the next! Many thanks!! Messenger of Truth [Audiobook Review] | my books. my life.